We live in times of great change. Or so we are told. Headlines blast messages about clashes between tribes, civilisations, political factions, East and West. We are told that unless we abstain from eating meat, flying or enjoying other modern amenities, the planet is doomed. We live in times of trouble. Of crossroads. Of signs of decline. We live in special times. In turn, future thinking is often reduced to people having opinions about other people’s opinions. As opposed to manifesto, in manifesto many small ideas are created to inspire one person, your- self. By sharing the vision of the future, we can avoid telling stories and instead strive to surround ourselves with as many strange, conflicting ideas that we can in order to immerse ourselves in future possibilities and possible futures. Incorporating recognisable examples, Minifesto will illustrate how the world changes when a single individual does something new. How individuals can revisualise the future and create tomorrow through small unique ideas. ● This is the age of the individual who with their individual small ideas make a big difference to our world. ● Minifesto will inspire and expose how the world of small ideas is waiting to happen. ● Fascinating stories of how small ideas came about and have today become a significant part of our daily lives. 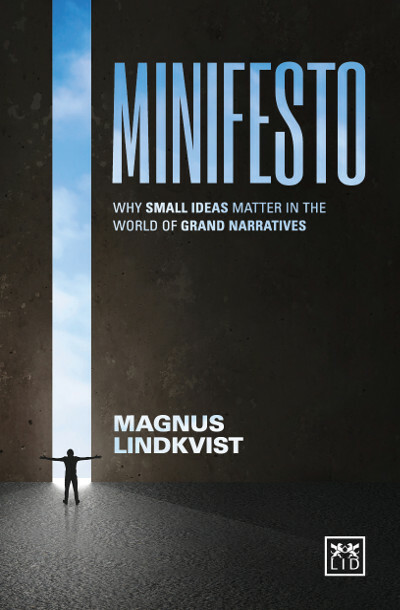 Magnus Lindkvist is an international futurist and consultant. He is the author of Everything We Know and When the Future Begins.